“From deep within each of us, carried from childhood through our actions and decisions, we keep close a fairytale of our own making. The innocence of make-believe that we think we grow out of never truly leaves us; yet too often, it refuses to shine as brightly as it once did. For all people a place exists where our thoughts grow into ideas and our ideas grow into reality. When we nurture that place and peer boldly into our imaginations, we discover the story we have been writing our whole lives. It is our greatest truth, the sum of our experiences, and the magic of our souls. 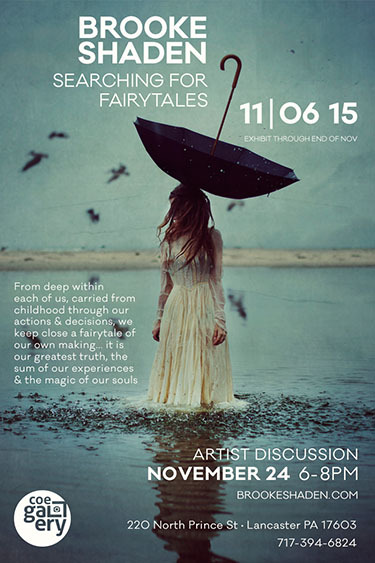 Join us for an evening with influential fine art photographer and Lancaster native, Brooke Shaden. Brooke will discuss the inspiration behind her exhibit, “Searching for Fairytales,” and will also engage in a question and answer session with those attending the event. Brooke Shaden began creating photographs after she graduated from Temple University with degrees in Filmmaking and English. She always wanted to be a storyteller, from writing poetry to writing screenplays, and found a good fit when she picked up her still camera at the start of 2009. From her first image she had a vision that was dark and morbid, which grew into a deep desire to photograph fairytales in that same style. Each image is crafted with careful planning, so that conceptualizing the images takes as much time as creating them. She shoots self-portraits as her foremost way of creating, though most images do not speak directly to pieces of her life. Instead, emotion and dreams are combined to create images that are often described as whimsical, dark and mysterious. Brooke grew up in Lancaster, PA and now resides in a small town in Arizona where she can create in her studio (the forest) or go hiking with her husband. She splits her time between creating images, doing motivational speaking, writing, and completing charity projects. Most recently she has opened a photography school in Kolkata, India for survivors of human trafficking called The Light Space. 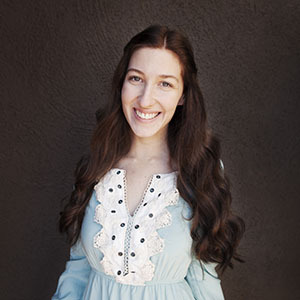 She was named one of the top 10 Most Influential Photographers in 2014, has been exhibited at The Annenberg Space for Photography, won the Ron Howard produced Project Imagination award, and was named one of the 30 Under 30 best female photographers.